The main dopaminergic pathways of the human brain. Dopaminergic pathways, sometimes called dopaminergic projections, are the sets of projection neurons in the brain that synthesize and release the neurotransmitter dopamine. Individual neurons in these pathways are referred to as dopamine neurons. Dopamine neurons have axons that run the entire length of the pathway. The neurons' somata produce the enzymes that synthesize dopamine, and they are then transmitted via the projecting axons to their synaptic destinations, where most of the dopamine is produced. Dopaminergic nerve cell bodies in such areas as the substantia nigra pars compacta tend to be pigmented due to the presence of the black pigment melanin. Dopaminergic pathways are involved in many functions such as executive function, learning, reward, motivation, and neuroendocrine control. Dysfunction of these pathways and nuclei may be involved in multiple diseases and disorders such as Parkinson's disease, attention deficit hyperactivity disorder, addiction, and restless legs syndrome (RLS). There are a number of dopaminergic pathways in the human brain. The four major ones are listed in the table below. pathway The mesolimbic pathway transmits dopamine from the ventral tegmental area (VTA), which is located in the midbrain, to the ventral striatum, which includes both the nucleus accumbens and olfactory tubercle. The "meso" prefix in the word "mesolimbic" refers to the midbrain, or "middle brain", since "meso" means "middle" in Greek. pathway The mesocortical pathway transmits dopamine from the VTA to the prefrontal cortex. The "meso" prefix in "mesocortical" refers to the VTA, which is located in the midbrain, and "cortical" refers to the cortex. Nigrostriatal pathway The nigrostriatal pathway transmits dopamine from the substantia nigra pars compacta (SNc) to the caudate nucleus and putamen. 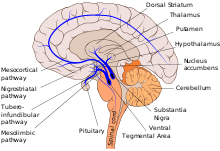 The substantia nigra is located in the midbrain, while both the caudate nucleus and putamen is located in the dorsal striatum. Tuberoinfundibular pathway The tuberoinfundibular pathway transmits dopamine from the arcuate nucleus (aka "infundibular nucleus") of the hypothalamus to the pituitary gland via dopamine release into the median eminence and subsequent circulation through the hypophyseal portal system. This pathway influences the secretion of certain hormones, including prolactin, from the pituitary gland. "Infundibular" in the word "tuberoinfundibular" refers to the cup or infundibulum, out of which the pituitary gland develops. activity of this pathway inhibits the release of prolactin. The mesocortical and mesolimbic pathways are sometimes referred to simultaneously as the mesocorticolimbic projection, system, or pathway. The dopaminergic pathways that project from the substantia nigra pars compacta and ventral tegmental area into the striatum (i.e., the nigrostriatal and mesolimbic pathways, respectively) form one component of a sequence of pathways known as the cortico-basal ganglia-thalamo-cortical loop. This method of classification is used in the study of many psychiatric illnesses. The nigrostriatal component of the loop consists of the SNc, giving rise to both inhibitory and excitatory pathways that run from the striatum into the globus pallidus, before carrying on to the thalamus, or into the subthalamic nucleus before heading into the thalamus. The dopaminergic neurons in this circuit increase the magnitude of phasic firing in response to positive reward error, that is when the reward exceeds the expected reward. These neurons do not decrease phasic firing during a negative reward prediction (less reward than expected), leading to hypothesis that serotonergic, rather than dopaminergic neurons encode reward loss. Dopamine phasic activity also increases during cues that signal negative events, however dopaminergic neuron stimulation still induces place preference, indicating its main role in evaluating a positive stimulus. From these findings, two hypotheses have developed, as to the role of the basal ganglia and nigrostiatal dopamine circuits in action selection. The first model suggests a "critic" which encodes value, and an actor which encodes responses to stimuli based on perceived value. However, the second model proposes that the actions do not originate in the basal ganglia, and instead originate in the cortex and are selected by the basal ganglia. This model proposes that the direct pathway controls appropriate behavior and the indirect suppresses actions not suitable for the situation. This model proposes that tonic dopaminergic firing increases the activity of the direct pathway, causing a bias towards executing actions faster. These models of the basal ganglia are thought to be relevant to the study of ADHD, Tourette syndrome, Parkinson's Disease, schizophrenia, OCD, and addiction. For example, Parkinson's disease is hypothesized to be a result of excessive inhibitory pathway activity, which explains the slow movement and cognitive deficits, while Tourettes is proposed to be a result of excessive excitatory activity resulting in the tics characteristic of Tourettes. Mesocorticolimbic pathways, as mentioned above in relation to the basal ganglia, are thought to mediate learning. Various models have been proposed, however the dominant one is that of temporal difference learning, in which a prediction is made before a reward and afterwards adjustment is made based on a learning factor and reward yield versus expectation leading to a learning curve. The mesocortical pathway is primarily involved in the regulation of executive functions (e.g., attention, working memory, inhibitory control, planning, etc. ), so it is particularly relevant to ADHD. The mesolimbic pathway regulates incentive salience, motivation, reinforcement learning, and fear, among other cognitive processes. The mesolimbic pathway is involved in motivation cognition. Depletion of dopamine in this pathway, or lesions at its site of origin, decrease the extent to which an animal is willing to go to obtain a reward (e.g., the number of lever presses for nicotine or time searching for food). Dopaminergic drugs are also able to increase the extent an animal is willing to go to get a reward, and the firing rate of neurons in the mesolimbic pathway increases during anticipation of reward. Mesolimbic dopamine release was once thought to be the primary mediator of pleasure, but is now believed to have only a minor role in pleasure perception. Two hypothesized states of prefrontal cortex activity driven by D1 and D2 pathway activity have been proposed; one D1 driven state in which there is a barrier allowing for high level of focus, and one D2 driven allowing for task switching with a weak barrier allowing more information in. The ventral tegmental area and substantia nigra pars compacta receive inputs from other neurotransmitters systems, including glutaminergic inputs, GABAergic inputs, cholinergic inputs, and inputs from other monoaminergic nuclei. The VTA contains 5-HT1A receptors that exert a biphasic effects on firing, with low doses of 5-HT1A receptor agonists eliciting an increase in firing rate, and higher doses suppressing activity. The 5-HT2A receptors expressed on dopaminergic neurons increase activity, while 5-HT2C receptors elicit a decrease in activity. The mesolimbic pathway, which projects from the VTA to the nucleus accumbens, is also regulated by muscarinic acetylcholine receptors. In particular, the activation of muscarinic acetylcholine receptor M2 and muscarinic acetylcholine receptor M4 inhibits dopamine release, while muscarinic acetylcholine receptor M1 activation increases dopamine release. GABAergic inputs from the striatum decrease dopaminergic neuronal activity, and glutaminergic inputs from many cortical and subcortical areas increase the firing rate of dopaminergic neurons. Endocannabinoids also appear to have a modulatory effect on dopamine release from neurons that project out of the VTA and SNc. Noradrenergic inputs deriving from the locus coeruleus have excitatory and inhibitory effects on the dopaminergic neurons that project out of the VTA and SNc. The excitatory orexinergic inputs to the VTA originate in the lateral hypothalamus and may regulate the baseline firing of VTA dopaminergic neurons. ^ a b At a chemical synapse, neurotransmitters are normally released from the presynaptic axon terminal and signal through receptors that are located on the dendrites of the postsynaptic neuron; however, in retrograde neurotransmission, the dendrites of the postsynaptic neuron release neurotransmitters that signal through receptors that are located on the axon terminal of the presynaptic neuron. Endocannabinoids signal between neurons through retrograde neurotransmission at synapses; consequently, the dopaminergic neurons that project out of the VTA and SNc release endocannabinoids from their dendrites onto the axon terminals of their inhibitory GABAergic and excitatory glutamatergic inputs to inhibit their effects on dopamine neuronal firing. ^ "Beyond the Reward Pathway". Retrieved 2009-10-23. ^ a b Le Moal, Michel. "Mesocorticolimbic Dopaminergic Neurons". Neuropsychopharmacology: The Fifth Generation of Progress. Retrieved 4 November 2013. ^ Alcaro, Antonio; Huber, Robert; Panksepp, Jaak (24 January 2017). "Behavioral Functions of the Mesolimbic Dopaminergic System: an Affective Neuroethological Perspective". Brain Research Reviews. 56 (2): 283–321. doi:10.1016/j.brainresrev.2007.07.014. ISSN 0165-0173. PMC 2238694. PMID 17905440. ^ Galvan, Adriana; Wichmann, Thomas (24 January 2017). "Pathophysiology of Parkinsonism". Clinical Neurophysiology. 119 (7): 1459–1474. doi:10.1016/j.clinph.2008.03.017. ISSN 1388-2457. PMC 2467461. PMID 18467168. ^ Blum, Kenneth; Chen, Amanda Lih-Chuan; Braverman, Eric R; Comings, David E; Chen, Thomas JH; Arcuri, Vanessa; Blum, Seth H; Downs, Bernard W; Waite, Roger L; Notaro, Alison; Lubar, Joel; Williams, Lonna; Prihoda, Thomas J; Palomo, Tomas; Oscar-Berman, Marlene (24 January 2017). "Attention-deficit-hyperactivity disorder and reward deficiency syndrome". Neuropsychiatric Disease and Treatment. 4 (5): 893–918. doi:10.2147/NDT.S2627. ISSN 1176-6328. PMC 2626918. PMID 19183781. ^ Volkow, Nora D.; Wang, Gene-Jack; Fowler, Joanna S.; Tomasi, Dardo; Telang, Frank; Baler, Ruben (24 January 2017). "Addiction: Decreased reward sensitivity and increased expectation sensitivity conspire to overwhelm the brain's control circuit". BioEssays. 32 (9): 748–755. doi:10.1002/bies.201000042. ISSN 0265-9247. PMC 2948245. PMID 20730946. ^ a b c d e f g Malenka RC, Nestler EJ, Hyman SE (2009). "Chapter 6: Widely Projecting Systems: Monoamines, Acetylcholine, and Orexin". In Sydor A, Brown RY (eds.). Molecular Neuropharmacology: A Foundation for Clinical Neuroscience (2nd ed.). New York: McGraw-Hill Medical. pp. 147–148, 154–157. ISBN 9780071481274. Neurons from the SNc densely innervate the dorsal striatum where they play a critical role in the learning and execution of motor programs. Neurons from the VTA innervate the ventral striatum (nucleus accumbens), olfactory bulb, amygdala, hippocampus, orbital and medial prefrontal cortex, and cingulate cortex. VTA DA neurons play a critical role in motivation, reward-related behavior, attention, and multiple forms of memory. ... Thus, acting in diverse terminal fields, dopamine confers motivational salience ("wanting") on the reward itself or associated cues (nucleus accumbens shell region), updates the value placed on different goals in light of this new experience (orbital prefrontal cortex), helps consolidate multiple forms of memory (amygdala and hippocampus), and encodes new motor programs that will facilitate obtaining this reward in the future (nucleus accumbens core region and dorsal striatum). ... DA has multiple actions in the prefrontal cortex. It promotes the "cognitive control" of behavior: the selection and successful monitoring of behavior to facilitate attainment of chosen goals. Aspects of cognitive control in which DA plays a role include working memory, the ability to hold information "on line" in order to guide actions, suppression of prepotent behaviors that compete with goal-directed actions, and control of attention and thus the ability to overcome distractions. ... Noradrenergic projections from the LC thus interact with dopaminergic projections from the VTA to regulate cognitive control. ^ Malenka RC, Nestler EJ, Hyman SE (2009). "Chapter 10: Neural and Neuroendocrine Control of the Internal Milieu". In Sydor A, Brown RY (eds.). Molecular Neuropharmacology: A Foundation for Clinical Neuroscience (2nd ed.). New York: McGraw-Hill Medical. p. 249. ISBN 9780071481274. Relationship of the hypothalamus and the pituitary gland. The anterior pituitary, or adenohypophysis, receives rich blood flow from the capillaries of the portal hypophyseal system. This system delivers factors released by hypothalamic neurons into portal capillaries at the median eminence. The figure shows one such projection, from the tuberal (arcuate) nuclei via the tuberoinfundibular tract to the median eminence. ^ Cragg SJ, Baufreton J, Xue Y, Bolam JP, Bevan MD (2004). "Synaptic release of dopamine in the subthalamic nucleus". Eur. J. Neurosci. 20 (7): 1788–802. doi:10.1111/j.1460-9568.2004.03629.x. PMID 15380000. ^ Doyon WM, Thomas AM, Ostroumov A, Dong Y, Dani JA (October 2013). "Potential substrates for nicotine and alcohol interactions: a focus on the mesocorticolimbic dopamine system". Biochem. Pharmacol. 86 (8): 1181–93. doi:10.1016/j.bcp.2013.07.007. PMC 3800178. PMID 23876345. ^ Taylor SB, Lewis CR, Olive MF (2013). "The neurocircuitry of illicit psychostimulant addiction: acute and chronic effects in humans". Subst Abuse Rehabil. 4: 29–43. doi:10.2147/SAR.S39684. PMC 3931688. PMID 24648786. ^ a b Maia TV, Frank MJ (2011). "From reinforcement learning models to psychiatric and neurological disorders". Nat. Neurosci. 14 (2): 154–62. doi:10.1038/nn.2723. PMC 4408000. PMID 21270784. ^ Beucke, Jan C.; Sepulcre, Jorge; Talukdar, Tanveer; Linnman, Clas; Zschenderlein, Katja; Endrass, Tanja; Kaufmann, Christian; Kathmann, Norbert (1 June 2013). "Abnormally High Degree Connectivity of the Orbitofrontal Cortex in Obsessive-Compulsive Disorder". JAMA Psychiatry. 70 (6): 619–29. doi:10.1001/jamapsychiatry.2013.173. ISSN 2168-622X. PMID 23740050. ^ Maia, Tiago V.; Cooney, Rebecca E.; Peterson, Bradley S. (1 January 2008). "The Neural Bases of Obsessive-Compulsive Disorder in Children and Adults". Development and Psychopathology. 20 (4): 1251–1283. doi:10.1017/S0954579408000606. ISSN 0954-5794. PMC 3079445. PMID 18838041. ^ Schultz W (2015). "Neuronal Reward and Decision Signals: From Theories to Data". Physiol. Rev. 95 (3): 853–951. doi:10.1152/physrev.00023.2014. PMC 4491543. PMID 26109341. ^ Malenka RC, Nestler EJ, Hyman SE (2009). "Chapter 13: Higher Cognitive Function and Behavioral Control". In Sydor A, Brown RY (eds.). Molecular Neuropharmacology: A Foundation for Clinical Neuroscience (2nd ed.). New York: McGraw-Hill Medical. pp. 313–321. ISBN 9780071481274. • Executive function, the cognitive control of behavior, depends on the prefrontal cortex, which is highly developed in higher primates and especially humans. In conditions in which prepotent responses tend to dominate behavior, such as in drug addiction, where drug cues can elicit drug seeking (Chapter 15), or in attention deficit hyperactivity disorder (ADHD; described below), significant negative consequences can result. ... ADHD can be conceptualized as a disorder of executive function; specifically, ADHD is characterized by reduced ability to exert and maintain cognitive control of behavior. Compared with healthy individuals, those with ADHD have diminished ability to suppress inappropriate prepotent responses to stimuli (impaired response inhibition) and diminished ability to inhibit responses to irrelevant stimuli (impaired interference suppression). ... Functional neuroimaging in humans demonstrates activation of the prefrontal cortex and caudate nucleus (part of the striatum) in tasks that demand inhibitory control of behavior. ... Early results with structural MRI show thinning of the cerebral cortex in ADHD subjects compared with age-matched controls in prefrontal cortex and posterior parietal cortex, areas involved in working memory and attention. ^ a b Engert, Veronika; Pruessner, Jens C (9 January 2017). "Dopaminergic and Noradrenergic Contributions to Functionality in ADHD: The Role of Methylphenidate". Current Neuropharmacology. 6 (4): 322–328. doi:10.2174/157015908787386069. ISSN 1570-159X. PMC 2701285. PMID 19587853. ^ Pezze, Marie A.; Feldon, Joram (1 December 2004). "Mesolimbic dopaminergic pathways in fear conditioning". Progress in Neurobiology. 74 (5): 301–320. doi:10.1016/j.pneurobio.2004.09.004. ISSN 0301-0082. PMID 15582224. ^ Salamone, John D.; Correa, Mercè (2012). "The Mysterious Motivational Functions of Mesolimbic Dopamine". Neuron. 76 (3): 470–485. doi:10.1016/j.neuron.2012.10.021. PMC 4450094. PMID 23141060. ^ Berridge KC, Kringelbach ML (May 2015). "Pleasure systems in the brain". Neuron. 86 (3): 646–664. doi:10.1016/j.neuron.2015.02.018. PMC 4425246. PMID 25950633. To summarize: the emerging realization that many diverse pleasures share overlapping brain substrates; better neuroimaging maps for encoding human pleasure in orbitofrontal cortex; identification of hotspots and separable brain mechanisms for generating ‘liking’ and ‘wanting’ for the same reward; identification of larger keyboard patterns of generators for desire and dread within NAc, with multiple modes of function; and the realization that dopamine and most ‘pleasure electrode’ candidates for brain hedonic generators probably did not cause much pleasure after all. ^ Berridge, Kent C; Kringelbach, Morten L (1 June 2013). "Neuroscience of affect: brain mechanisms of pleasure and displeasure". Current Opinion in Neurobiology. 23 (3): 294–303. doi:10.1016/j.conb.2013.01.017. PMC 3644539. PMID 23375169. ^ Durstewitz, Daniel; Seamans, Jeremy K. (1 November 2008). "The dual-state theory of prefrontal cortex dopamine function with relevance to catechol-o-methyltransferase genotypes and schizophrenia". Biological Psychiatry. 64 (9): 739–749. doi:10.1016/j.biopsych.2008.05.015. ISSN 1873-2402. PMID 18620336. ^ Seamans, Jeremy K.; Yang, Charles R. (1 September 2004). "The principal features and mechanisms of dopamine modulation in the prefrontal cortex". Progress in Neurobiology. 74 (1): 1–58. doi:10.1016/j.pneurobio.2004.05.006. PMID 15381316. ^ Shin, Jung Hoon; Adrover, Martín F.; Wess, Jürgen; Alvarez, Veronica A. (30 June 2015). "Muscarinic regulation of dopamine and glutamate transmission in the nucleus accumbens". Proceedings of the National Academy of Sciences of the United States of America. 112 (26): 8124–8129. doi:10.1073/pnas.1508846112. ISSN 0027-8424. PMC 4491757. PMID 26080439. ^ a b c Melis M, Pistis M (December 2007). "Endocannabinoid signaling in midbrain dopamine neurons: more than physiology?". Curr. Neuropharmacol. 5 (4): 268–277. doi:10.2174/157015907782793612. PMC 2644494. PMID 19305743. Thus, it is conceivable that low levels of CB1 receptors are located on glutamatergic and GABAergic terminals impinging on DA neurons [127, 214], where they can fine-tune the release of inhibitory and excitatory neurotransmitter and regulate DA neuron firing. ^ a b c d e f g Morikawa, Hitoshi; Paladini, Carlos A. (15 December 2011). "Dynamic Regulation of Midbrain Dopamine Neuron Activity: Intrinsic, Synaptic, and Plasticity Mechanisms". Neuroscience. 198: 95–111. doi:10.1016/j.neuroscience.2011.08.023. ISSN 0306-4522. PMC 3221882. PMID 21872647. ^ a b Chandler DJ, Waterhouse BD, Gao WJ (2014). "New perspectives on catecholaminergic regulation of executive circuits: evidence for independent modulation of prefrontal functions by midbrain dopaminergic and noradrenergic neurons". Front Neural Circuits. 8: 53. doi:10.3389/fncir.2014.00053. PMC 4033238. PMID 24904299. It has been shown that electrical stimulation of LC results in an excitation followed by a brief inhibition of midbrain dopamine (DA) neurons through an α1 receptor dependent mechanism (Grenhoff et al., 1993). ^ a b c d e f Flores A, Maldonado R, Berrendero F (2013). "Cannabinoid-hypocretin cross-talk in the central nervous system: what we know so far". Front Neurosci. 7: 256. doi:10.3389/fnins.2013.00256. PMC 3868890. PMID 24391536. Direct CB1-HcrtR1 interaction was first proposed in 2003 (Hilairet et al., 2003). Indeed, a 100-fold increase in the potency of hypocretin-1 to activate the ERK signaling was observed when CB1 and HcrtR1 were co-expressed ... In this study, a higher potency of hypocretin-1 to regulate CB1-HcrtR1 heteromer compared with the HcrtR1-HcrtR1 homomer was reported (Ward et al., 2011b). These data provide unambiguous identification of CB1-HcrtR1 heteromerization, which has a substantial functional impact. ... The existence of a cross-talk between the hypocretinergic and endocannabinoid systems is strongly supported by their partially overlapping anatomical distribution and common role in several physiological and pathological processes. However, little is known about the mechanisms underlying this interaction. ... Acting as a retrograde messenger, endocannabinoids modulate the glutamatergic excitatory and GABAergic inhibitory synaptic inputs into the dopaminergic neurons of the VTA and the glutamate transmission in the NAc. Thus, the activation of CB1 receptors present on axon terminals of GABAergic neurons in the VTA inhibits GABA transmission, removing this inhibitory input on dopaminergic neurons (Riegel and Lupica, 2004). Glutamate synaptic transmission in the VTA and NAc, mainly from neurons of the PFC, is similarly modulated by the activation of CB1 receptors (Melis et al., 2004). ^ a b Aston-Jones G, Smith RJ, Sartor GC, Moorman DE, Massi L, Tahsili-Fahadan P, Richardson KA (February 2010). "Lateral hypothalamic orexin/hypocretin neurons: A role in reward-seeking and addiction". Brain Res. 1314: 74–90. doi:10.1016/j.brainres.2009.09.106. PMC 2819557. PMID 19815001. ^ a b Jäntti MH, Mandrika I, Kukkonen JP (2014). "Human orexin/hypocretin receptors form constitutive homo- and heteromeric complexes with each other and with human CB1 cannabinoid receptors". Biochem. Biophys. Res. Commun. 445 (2): 486–90. doi:10.1016/j.bbrc.2014.02.026. PMID 24530395. Orexin receptor subtypes readily formed homo- and hetero(di)mers, as suggested by significant BRET signals. CB1 receptors formed homodimers, and they also heterodimerized with both orexin receptors. ... In conclusion, orexin receptors have a significant propensity to make homo- and heterodi-/oligomeric complexes. However, it is unclear whether this affects their signaling. As orexin receptors efficiently signal via endocannabinoid production to CB1 receptors, dimerization could be an effective way of forming signal complexes with optimal cannabinoid concentrations available for cannabinoid receptors. This page was last edited on 20 February 2019, at 23:51 (UTC).